Delivers up to 3X more run-time, 20% more power and 2X more life than standard 18 volt lithium-ion batteries. The M18 REDLITHIUM XC6.0 Extended Capacity Battery Pack features superior pack construction, electronics, and performance to deliver more work per charge and more work over the life of the pack than any battery on the market. 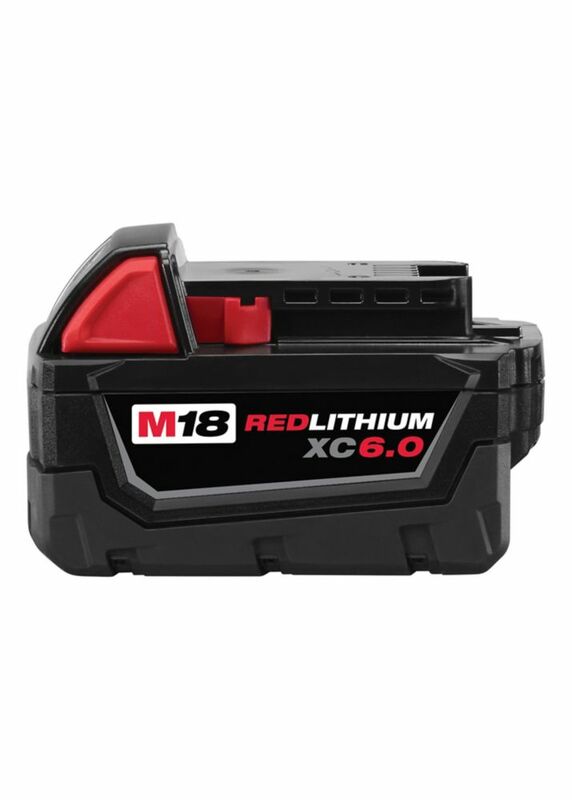 The M18 REDLITHIUM XC6.0 Battery features an advanced design, protecting the pack against harsh jobsite environments. This protection routes water away from the electronics and out of the battery pack, extends run-time and life by minimizing heat, and prevents pack failures from vibration or drops. This unique to Milwaukee design also allows the battery to operate in extreme cold weather conditions (below OoF/-18oC). Upgrade to the M18 REDLITHIUM XC6.0 Battery Pack to instantly increase the run-time and durability of your M18 cordless tools. The BLACK+DECKER LBXR2020-OPE 20v Max 2.0 Ah Lithium Battery Pack is designed to be compatible with Black & Decker 20 Volt Max lithium ion cordless tools and outdoor equipment. The 2.0 ah cells allow for 33% more run time than the LBXR20. This battery is easy to install remove and is always ready to go due to the lithium's battery ability to hold a charge for an extended amount of time. This battery is backed by Black & Decker's 2 year limited warranty. DeWalt's new 20V MAX Power Tools are designed to surpass professionals' expectations with the power to withstand rigorous jobsite applications, while also providing comfort and ease of use. 20V MAX Tools deliver up to 57% faster application speed and up to 35% greater runtime than other leading 18V lithium-ion tools. The DCB201 20V MAX Lithium-Ion Compact 1.5 Ah battery is compatible with all tools in DeWalt's 20V MAX System. This battery is recommended for use in tools completing light to medium duty applications. Keep your DEWALT 20V power tools powered on the jobsite with extra battery packs. The DCB203-2 20V Lithium-Ion Battery two-pack is compatible with the complete line of DEWALT 20V MAX tools and accessories. These batteries are backed by a 3-year limited manufacturer warranty and 2-year free service contract for added peace of mind. The ECHO 58V 2 Ah Lithium-Ion Accessory Battery Pack is the most advanced, professional grade high voltage cordless Battery in the industry. Featuring triple protection electronics, this battery is equipped to prevent overcharging, overheating and overloading. With a 30 Minute recharge time, users can complete big jobs without worrying about running out of power. The ECHO 2 Ah Lithium-Ion Accessory Battery is backed by an industry-leading 90-day money-back guarantee, a 5-year consumer warranty and a 2-year commercial warranty. M18 Redlithium XC6.0 Battery Pack Delivers up to 3X more run-time, 20% more power and 2X more life than standard 18 volt lithium-ion batteries. The M18 REDLITHIUM XC6.0 Extended Capacity Battery Pack features superior pack construction, electronics, and performance to deliver more work per charge and more work over the life of the pack than any battery on the market. The M18 REDLITHIUM XC6.0 Battery features an advanced design, protecting the pack against harsh jobsite environments. This protection routes water away from the electronics and out of the battery pack, extends run-time and life by minimizing heat, and prevents pack failures from vibration or drops. This unique to Milwaukee design also allows the battery to operate in extreme cold weather conditions (below OoF/-18oC). Upgrade to the M18 REDLITHIUM XC6.0 Battery Pack to instantly increase the run-time and durability of your M18 cordless tools. M18 Redlithium XC6.0 Battery Pack is rated 4.9 out of 5 by 16. Rated 5 out of 5 by SDwoodworker from Best high-capacity M18 battery that fits in original Milwaukee cases without having to cut or mod... Best high-capacity M18 battery that fits in original Milwaukee cases without having to cut or modify the case to fit (such as with 9.0HD). **This 6.0 battery, at 108 Wh, can NOT be transported by commercial airplane**. Though charge time is about 14-18 minutes longer than identical looking M18 5.0Ah, the additional tool-up time is worth the extra charge time. I will be getting some high-output 6.0 batteries as soon as they become locally available and do a side-by-side comparison of run- and charge-times. Can't wait for that showdown! Rated 5 out of 5 by GearaDoga from Works as expected. Exactly what you expect. Works just as well as the stock batteries, but lasts a whole lot longer. Saves a lot of battery swapping and charging time. Rated 5 out of 5 by Joyce from Excellent run time. I've used Milwaukee products for years and... Excellent run time. I've used Milwaukee products for years and it's pure quality. Rated 4 out of 5 by Joy2017 from Excellent and dependable Milwaukee has done it again. The 6.0ah battery is just right for an older person with little arm strength. It's a work horse if a battery.